Email: In the manga, I’m starting to have my doubts though. Because… isn’t manga Alucard a total [censored] who kills large numbers of people just because he can? Erin: Eheh… that’s overly harsh on him, isn’t it? Erin: Well, I’ll let you decide for yourselves. Let’s take a look at his list of kills. volume 3: A unit of soldiers who come in with intent to kill him, and the rest of their compatriots. Also, some civilians and reporter types, but those were unintentional; we was aiming at Alhambra, who dodged. 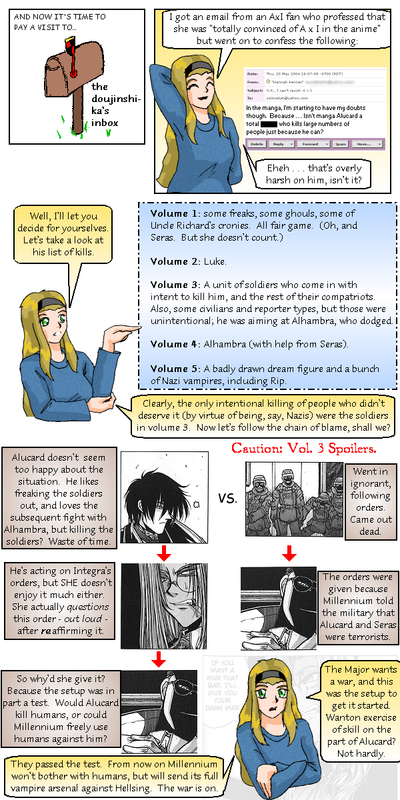 Volume 4: Alhambra (with help from Seras). Volume 5: A badly drawn dream figure and a bunch of Nazi vampires, including Rip. Erin: Clearly, the only intentional killing of people who didn’t deserve it (by virtue of being, say, Nazis) were the soldiers in volume 3. Not let’s follow the chain of blame, shall we? Alucard doesn’t seem too happy about the situation. He likes freaking the soldiers out, and loves the subsequent fight with Alhambra, but killing the soldiers? Waste of time. Went in ignorant, following order. Came out dead. He’s acting on Integra’s orders, but she doesn’t enjoy it much either. She actually questions this order – out loud – after reaffirming it. The orders were given because Millennium told the military that Alucard and Seras were terrorists. So why’d she give it? Because the setup was in part a test. Would Alucard kill humans, or could Millennium freely use humans against him? Erin: They passed the test. From now on Millennium won’t bother with humans, but will send its full vampire arsenal against Hellsing. The war is on. The Major wants a war, and this was the setup to get it started. Wanton exercise of skill on the part of Alucard? Not hardly.